Evergreen shrub for year-round interest. Perfect for a sunny border or large patio pot. Slender shiny dark green foliage and from late spring to autumn has deep pink blooms. Proven performer leading - awarded the RHS Award of Garden Merit. Delivered as an established plant in a 9cm pot. Here's a lovely evergreen shrub that's perfect for a sunny border or a large patio pot. It bears slender, shiny dark green foliage throughout the year and from late spring to autumn becomes smothered with deep pink lantern blooms. 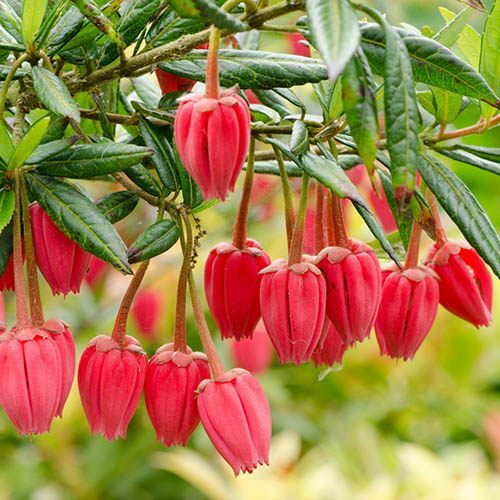 Easy to care for, the Chilean Lantern tree thrives in UK gardens and is a proven performer leading to the RHS Award of garden Merit. Delivered as an established plant in a 9cm pot. Grow on in a larger pot now or plant into border soil. Grow in fertile, moist but well-drained acid soil. Prefers partial shade or in sun where the roots can be kept cool and shaded. Prefers a sheltered position – ideal for a woodland garden. Blooms form from the autumn so provide frost protection where necessary over winter in more exposed positions. In late winter, feed with slow-release fertilizer, as well as some sulphate of potash, then mulch around your shrub with ericaceous compost, pine needles or leaf mould. Pruning can be done in spring or autumn after flowering, when you can lightly cut back any shoots that spoil the shape of the plant. Remove any dead or damaged branches and thin out to let light in to the centre of the bush to help flowering the following year.